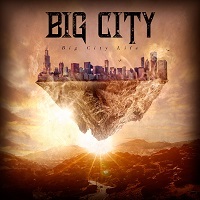 “Big City Life” begins as a Melodic band. This Norwegian band are talented musicians who are Melodic in their music. This first song is a beautiful song that may bring a tear to one’s eye. It is just lovely with good guitar and good vocals. “Daemon in the Dark” begins soft and exotic then goes into a bit heavy only in a melodic way. The guitar is every guitarist dream. The heavenly voice of the vocals will melt one’s heart. It’s a sad song about broken love. It will make one cry but also bring joy to one’s heart. A good song for a break-up to be blasted out of the car window. “Stars Surrounding” is just a good Rock song. This is the most interesting song and one that may be the best on the album but it could go unnoticed. It is just simple with good vocals, drums, and guitars, and bass. This is a favorite. “Forgive me Now” is another note-worthy song that is just good in every way. Hauntingly beautiful and sad. It is a song to say sorry for breaking one’s heart. It makes one cry. This is a tear jerker. The melody is wonderfully pleasant. “Home Again” this is the end of the album that is a great way to end. The melodies from these musicians is what Melodic Rock is all about. The soft and soothing voice with the guitars along with the lyrics work well in every way. A fantastic guitar solo. The song is soft and sweet, it will make one think about one’s life. It is wonderful and beautiful. It is goodbye. This band is one of those that only a special few will truly enjoy to the core their music but everyone will like the music. It is filled with emotions and love throughout.